Dr. Mohamed Mahmoud Ali Mahmoud completed his MD from Al-Azhar University in 2014 and his Master Degree in Radio Diagnosis from Ain Shams University in 2009. Furthermore he completed his Bachelor’s of Medicine and Surgery in 2003 Al-Azhar University. 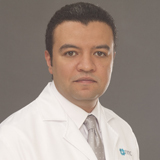 Dr. Mohamed Mahmoud Ali Mahmoud has 16 year experience in Radiology with such hospitals as Maadi Military Hospital, Aswan Oncology Institute and El-Marwa Private Hospital. He can converse with his patients in English and Arabic.